A pretty pair of baroque style vintage ornaments comprising a cluster of pastel tone beads and gold leaves on a filigree back. The bronzetone comb is 25mm wide. 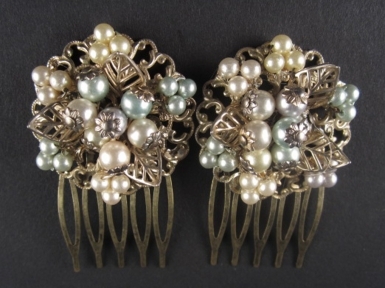 available as single comb for �32. They come beautifully presented in a black and gold embossed fur-lined (faux of course! )box.